RocketMiles: Get 1,000 bonus points when you use this link to make a new RocketMiles account and make/complete your first hotel reservation. Auntie Anne’s Pretzels: Buy one Heart-Shaped Pretzel and get another Heart-Shaped Pretzel for free, with coupon (coupon in link). Offer only good on February 14, 2019. Black Angus Steakhouse: is featuring a Prime Rib and Crab Cake dinner for Valentine’s. For $29.99 per person, get a tender, slow-roasted Prime Rib with a crisp Crab Cake, 2 Classic Sidekicks and sweet molasses bread. Offer good February 14-17, 2019. Buca di Beppo: is featuring a Valentine’s Day Love Feast dinner for two for $49.99. The meal includes Heart-Shaped Lasagna, Buca Small Garlic Bread, Buca Small Mixed Green or Caesar Salad and Mini Chocolate Chip Cannoli. Offer only good on February 14, 2019. California Pizza Kitchen: has a Valentine’s Sweet Deal for 2 menu. Choose an appetizer, two entrees and a dessert for just $35. Entrees include pizza, pasta, and full-size salads. Offer good February 13-17, 2019. Carabbas’s: has Valentine’s specials in 3 tiers: $45, $55 or $65 for a special meal for two. Offer ends February 17, 2019. Firehouse Subs: has a free dessert with any purchase on Valentine’s Day. with coupon (coupon in link). Offer only good on February 14, 2019. Fleming’s Prime Steakhouse: is serving their annual three-course Valentine’s Day dinner featuring an 8 oz. Filet Mignon with your choice of King Crab or Colossal Shrimp. Prices are about $75, with $37 for wine pairing. Offer ends February 18, 2019. Fogo de Chao: has a free dining card for couples who dine with them from February 14-17, 2019. Free dining card, valued up to $63.95, is valid for one complimentary lunch or dinner with equal purchase from February 18 through May 2, 2019, Sundays–Thursdays only. Hooters: has a buy 10, get 10 free deal on chicken wings on Valentine’s Day in their annual “Shred Your Ex” promotion. Get 10 free boneless wings with the purchase of any 10 wings by shredding an image of your ex at your local Hooters or online at hooters.com/ShredYourEx. Offer only good on February 14, 2019. Macaroni Grill: get a three-course prix fixe dinner for $45 per couple. Dinner includes a choice of one antipasti like Calimari or Bruschetta, a choice of one entrée such as Shrimp Scampi or Chicken Parmesan, and a choice of one dessert such as Tiramisu or Decadent Chocolate Cake. Offer good through February 14, 2019. Potbelly Sandwich Shop: they will celebrating singles on Valentines Day by offering a free cookie to anyone who goes to a Potbelly without a significant other on Feb. 14, 2019. Singles can choose one of the legendary cookies for free, including a special red velvet cookie, a rich chocolaty cookie bursting with white chocolate chips. Offer only good on February 14, 2019. Qdoba Mexican Grill: has their annual Qdoba for a Kiss special this Valentine’s Day. At any participating Qdoba restaurant on February 14, 2019, guests who purchase one entrée and share a kiss with a friend or significant other will receive a second entrée (of equal or lesser value) for free. (OK, is it just me, or is that just a little creepy?). American Tourister: 30-70% of American Tourister backpacks, under seat carry-on & a huge variety of other bags. Sale ends February 12, 2019. Samsonite: Weekly Steal! Great deals on select Samsonite bags! Offer ends February 13, 2019. FuelRods: Save 10% on FuelRod Power-to-Go Kits with Code: Super19 at all US kiosks. Offer ends February 17, 2019. Pizza Hut: Get any large pizza for $10.99 with promo code THANKYOU. Offer ends February 17, 2019. Schlitterbahn (New Braunfels, South Padre Island & Corpus Christi): Buy 4 general admission tickets and get: 4 Admission Tickets* for Day of Check-In AND Check-Out (Two Days of Play, Accommodations** at a Schlitterbahn Resort (Wake Up By a Waterpark), Early Ride Time on Selected Attractions (Details vary by Park), After Hours Access to Selected Attractions, Amazing Amenities Unique to Each Resort, on stays through September 2019. Offer ends February 18, 2019. 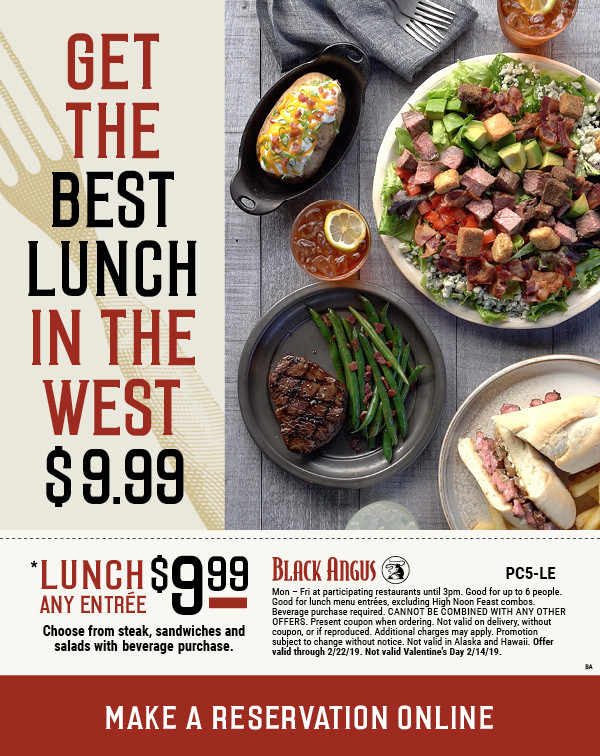 Black Angus: Get any lunch entree for $9.99 or get $12 off delivery with coupon (coupon in link). Offer ends February 22, 2019. Civil Rights Museum (Atlanta) – Regularly $19, admission is FREE during Black History Month. Offer ends February 28, 2019. Sam’s Club: Save 20% off a 1-year membership. offer ends March 8, 2019. Monster Jam Trucks (Las Vegas): Save up to 30% off admission. Offer only good for 7:00pm show on March 23, 2019. Potomac River Cruise To See Cherry Blossoms (Washington DC): Save 50% off tickets. Offer ends April 13, 2019. McDonald’s (Orlando): FREE Happy Meal with purchase of any Extra Value Meal. Valid only at the McDonald’s restaurants located at 6875 W. Sand Lake Road, 5400 S. Kirkman Road or 5401 Altamira Drive, Orlando, FL. Offer ends April 30, 2019. Medieval Times (Kissimmee): Save up to $26 per person with code PSB19. Offer ends April 30, 2019. GatorWorld Parks (Howey-In-The-Hills FL): Save 57% off admission. Offer ends September 30, 2019. Grand Canyon or Las Vegas Strip Helicopter Tours: Save up to 43% per person. Offers end December 30, 2019. Legoland California & Sea Life: Save 18% and get an extra day free. Offer ends December 31, 2019.